If you don't know Sazan, check $NXT $ARDR on Twitter. A dedicated Nxter since 2013, running several nodes, and just as trigger-happy but fair in his harsh comments to Jelurida on Slack as he is on Twitter whenever an article about PoS without Nxt being mentioned comes across his screen. Sazan is lightning, when it comes to tweeting news, finding new press clips and mentions of Nxt, Ignis, Ardor, clones and child chains. 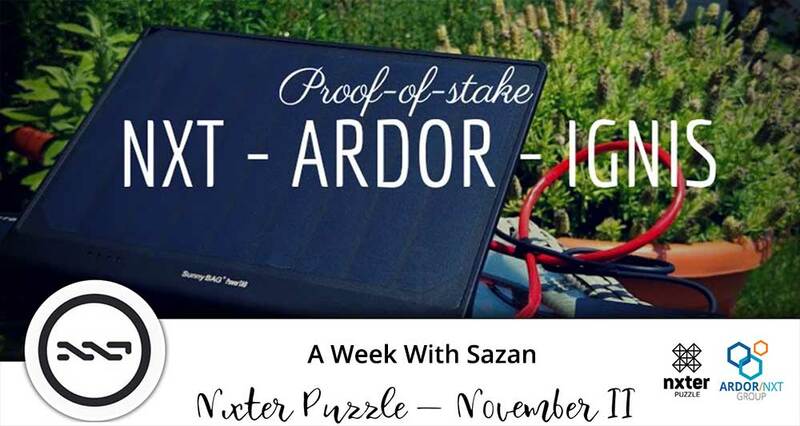 A true blockchain supporter, a Maker, powered by Nxt and Ardor love and solar energy - this week's Nxter Puzzle could not be dedicated to anyone but the unparallelled Mr. Sazan Avdiu. I have a passphrase, it consists of 14 words. Sazan puts 2 words per day randomly in his tweets with the hashtag #NxterPuzzleWord [number] — [word]. Example: #NxterPuzzleWord 1 — generation. Prize account ID is ARDOR-XWUV-PET6-CT3V-HXNP7. 100 IGNIS to win at the moment, thanks to ANG (ardornxt.io).